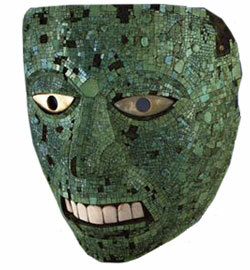 Aztec/Mixtec, from Mexico. Thought to represent the god-king Quetzalcoatl or the sun god Tonatiuh. 15th-16th century AD. Founded in 1753, the British Museum holds in trust for the world a collection of art and antiquities from ancient and living cultures. Founded by an Act of Parliament, the British Museum was the first public museum in the world. From the beginning, its collections were made available to every citizen free of charge, to all "studious and curious" people regardless of rank or status. The British Museum has always been a world museum, first through its far-reaching collections amassed during the Age of Enlightenment and more recently by reflecting a global heritage to its increasing number of international visitors. More than six million people visit it every year, including nearly one million from North America, making it one of the most popular museums in the world.